Tom Soares of Wimbledon tries to drag Posh star Marcus Maddison to his feet. Photo: Joe Dent/theposh.com. With Peterborough United staff channelling their inner, myopic version of, Arsene Wenger, it was left to Wimbledon boss Neal Ardley to properly articulate the most talked-about point from this contest. “I rate Marcus Maddison,” Ardley announced. “I respect him as a top player, but he should be embarrassed with what he did today (November 12). I don’t like to see professionals trying to get fellow professionals sent off. Posh player Marcus Maddison during the game at Wimbledon. Photo: Joe Dent/theposh.com. And there you have it. A top talent at League One level with a maddening habit. A budding thespian, but not a very good one at that. Maddison dominated this 90 minutes. He set up a goal before winning and converting a penalty in the first half and then sent in a stream of second half crosses and passes that deserved to lead to a very welcome three points for Posh. He was by far and away the game’s biggest talent, but then, 10 minutes from time, he ruined it all, with a fall Norman Wisdom might well have appreciated, but which would have led the thousands watching on TV to shout angrily at the screen in anger (neutrals) or to cringe with embarrassment with eyes peering between fingers (Posh fans). Although judging by the instant reaction on Twitter, many Posh fans were also venting furiously. Never can such a star player have been so unloved by his own club’s fanbase. Posh goalscorer Danny Lloyd in action at Wimbledon. Photo: Joe Dent/theposh.com. The dastardly deed unfolded thus: Maddison lost possession (unfairly he thought), fouled an opponent (a necessity as Wimbledon would have been on the break) and then he and Liam Trotter came together, dangerously so with heads close to one another, and the slighest of contacts (or maybe a strong draught) was enough to send the Posh player down to the ground as though felled by Anthony Joshua. It was a desperate moment and completely self-defeating as, instead of discussing a high-class individual display - Maddison became the first player to both score and create a goal in three different League One games this season according to Opta Joe - the assembled media, which included some writing for national titles, were debating the ‘incident.’ And not in admiring terms. Luckily impressive match referee Darren Handley wasn’t fooled and, if Posh are fortunate, he cautioned Maddison for his simulation which would render any further punishment impossible. McCann revealed he didn’t see that moment, but he did see his team dominate the second-half at Kingsmeadow and was therefore rather frustrated at the failure to secure the win that would have sent Posh into the top six. 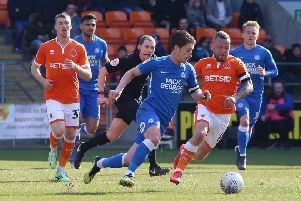 Chances came and went with Jack Marriott missing two headed opportunities and Gwion Edwards not quite managing to find a finish to match his outstanding raiding down the left wing, but to blame the forward players for the return of only a point would be misleading. Wimbledon started this game having scored just nine goals in 16 League One matches. Ardley felt though he could trouble the Posh back line so fielded a slightly more adventurous formation than normal. Even he didn’t probably expect it to pay off after 36 seconds. That’s all it took for Lyle Tyler to advance unchallenged to the edge of the Posh penalty area and to find the corner of the net with a low drive, but that goal was brilliantly defended compared to a second home goal just before the break, one that a Sunday pub team would have hoped to avoid. Wimbledon won a throw in by their own corner flag which led to a huge punt upfield by defender Deji Oshilaja. It landed 60 yards further downfield where bizarrely Jack Baldwin let it go over his head to Cody McDonald who promptly raced away and scored. The Crazy Gang from these parts would have loved that goal, as would former England boss Graham Taylor, but for defenders of this standard it was nonsensical. Baldwin actually went on to play strongly in the second half, but he’s becoming an outfield version of former Posh ‘keeper Joe Lewis with moments of excellence overshadowed by regular errors. The axe could well be hovering over the captain’s head. Thankfully for Posh they scored twice in between the Dons’ goals. Maddison’s set piece was headed in by Danny Lloyd (with considerable help from Fuller) on his first Football League start on 25 minutes and Maddison’s perfect penalty gave McCann’s men a 38th-minute lead they really should have maintained despite some other jittery defensive moments. Harry Forrester and Mark Bircham missed decent chances to score for Dons in the first half, while Trotter headed over the bar from close range late on. It was a far more interesting contest than many envisaged even if both teams had big incentives to win - Dons would have moved out of the bottom four with three points - but the big post-match debate this morning (November 13) won’t centre on anything positive. Posh: Jonathan Bond, Jack Baldwin, Steven Taylor, Ryan Tafazolli, Leo Da Silva Lopes (sub Andrew Hughes, 69 mins), Gwion Edwards, Anthony Grant, Michael Doughty, Marcus Maddison, Danny Lloyd (sub Idris Kanu, 81 mins), Jack Marriott. Unused substitutes: Chris Forrester, Conor O’Malley, Jermaine Anderson, Callum Chettle, Alex Penny. AFC Wimbledon: George Long, Barry Fuller, George Francomb, Deji Oshilaja, Darius Charles, Harry Forrester, Liam Trotter, Tom Soares, Cody McDonald, Lyle Taylor, Andy Barcham (sub Jon Meades, 73 mins). Unused substitutes: Joe McDonnell, Paul Robinson, Toby Sibbick, Egli Kaja, Anthony Hartigan, Paul Kalambayi. Goals: Posh - Lloyd (25 mins), Maddison (pen, 38 mins). Wimbledon - Taylor (1 min), McDonald (45 mins). Cautions: Posh - Maddison (unsportsmanlike conduct). Wimbledon - Francomb (foul), Trotter (unsportsmanlike conduct).